Growing up my mother was the master of busy weeknight meals, the queen of cookies; you name it...the best! But her take on Saturday breakfast was her particular area of expertise if you ask me. Saturday breakfasts were feasts of perfectly made-from-scratch biscuits and country sausage gravy, or fluffy pancakes, crispy hash browns, fried eggs, and perfectly browned sausage links. To this day, I don't know how she was able to cook all of our fried eggs exactly the way we liked them since we all liked them done differently. I swear she had a sixth sense about cooking things so that everything would miraculously all be done at exactly the same time. The woman sure knew her way around the wonderful smorgasbord of the breakfast world. It was quite the project feeding a family of ten, but she was in her element in the kitchen. She had a glow about her, bouncing about the kitchen, flipping pancakes, turning sausage, buttering toast, most often with a smile on her face and a song on her lips. I will never forget the first time she made German Pancakes for us. Once the timer rang to take the pancakes out of the oven, she called me over to take a peek. My eyes couldn't take it all in. The ever-expanding golden mass of pancake deliciousness and, mercy me...the smell! It was a thing of my dreams! My senses were exploding and I hadn't even tasted them yet! Paired with powdered sugar and sweet blackberry syrup, it immediately became my favorite breakfast, hands down. Now I have a family of my own and it is still a favorite dish I make several times a year. I have since discovered that my favorite way to eat this puffy, fluffy dish is in the miniature form. Isn't miniature always better? I don't know about you, but it always seems easier for me to eat five Fun Size Snickers bars than a single full size Snickers bar. 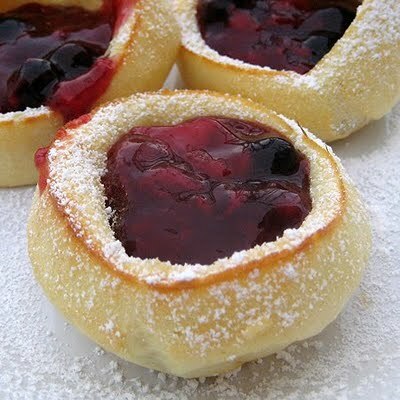 Anyway, get ready to excite all of your senses and don't forget to dust a sprinkling of powdered sugar on them, followed by the Blackberry* Syrup recipe from The Ultimate Cook'n Cookbook (free with every Cook'n purchase!) to top these babies. And let us not forget the wonderful health benefits of the powerful little blackberry. Being rich in antioxidants, blackberries help the body in fighting free radicals and thus, avoid various types of cancer. Anthocyanins are antioxidants found in blackberries that are responsible for giving blackberries their rich and dark color. This concentrated pigment of blackberries is acknowledged with decreasing the rate at which the memory deteriorates. Blackberries contain a compound called salicylic acid. Salicylic acid has been proven to numb bodily pains and treat unusually high body temperature, or fevers. Salicylic acid may have similar properties to aspirin that aid in protecting the body against heart disease. Arguably, the most beneficial property of the blackberry is its profusion of ellagic acid. In experimental studies, ellagic acid is used to treat tumors and is reliable for causing the death of particular cancer cells. Researchers believe that ellagic acid may also work to reduce the harmful effects of estrogen that create breast cancer cells. Blackberries have both soluble and insoluble fiber. One cup of blackberries has an average of 7.6 g of fiber and contains half the daily recommended dose of vitamin C, which protects the immune system and can lower the risk of developing certain cancers. *You can substitute blackberries with blueberries or raspberries. Or do a combination of all three, which is also delicious. 2. Blend first six ingredients (milk thru zest) in a blender. Be careful to see that any flour clumps get well-blended. 3. Blend in butter a little at a time in order to temper the eggs. 5. Bake for 15 minutes, or until puffy and golden on top.